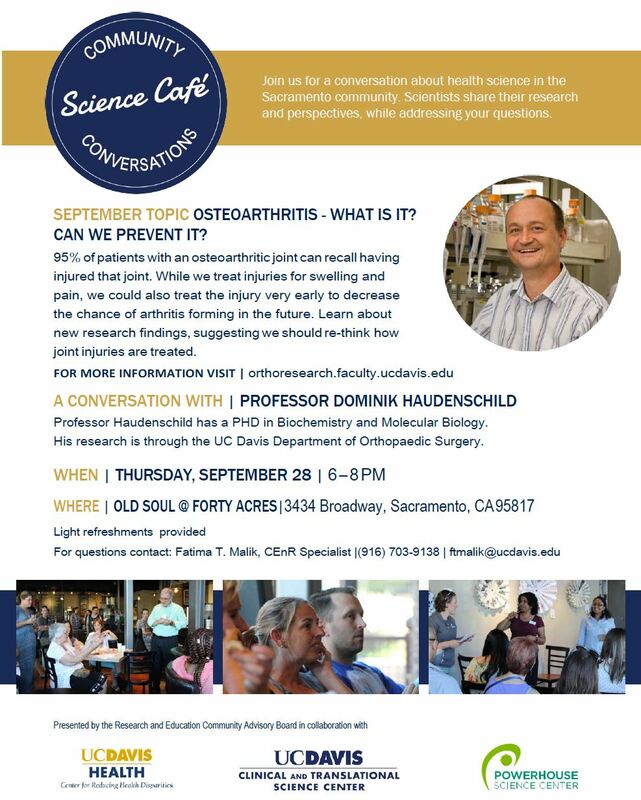 If you’re in the Sacramento area, I’ll be at the Science Cafe tonight from 6pm to 8pm to discuss the topic “Osteoarthritis – What is it? Can we prevent it?”. The Science Cafe is an ongoing conversation about health science in the Sacramento Community, where Scientists share their research and perspectives, while addressing your questions. The Sacramento Science Cafe is hosted by the Old Soul @ Forty Acres coffee house, on 3434 Broadway, Sacramento CA 95817. It is presented in collaboration with UC Davis Health, and Powerhouse Science Center. ‹ Lab’s Second Patent Issued on Cdk9 in Arthritis!